Last week I made some of these for our girls. And I love them. Practical? Not really. But I say who cares! I only have my little girls for a short while and I plan on loving every minute, whether it’s practical or not. So if your like me and your heart skips a beat when you see your daughter all dressed up then follow these instructions to make a perfectly impractical headpiece just like this one. *Some wool or felt (enough to cover the trivet). *Some netting (I used black tulle). *A barrette or a similar type of hair fastener. *Items to decorate with (I used feathers and vintage buttons). *A glue gun and glue sticks. Step #1. Glue a handful of batting onto your trivet then place your trivet batting side down to the wrong side of your fabric. Step #3. Hot glue your hair fastener to this bottom messy side. Step #5. Cut a strip of your fabric long enough to wrap around the base of your headpiece. Step #6. Roll or fold your fabric into a long snake and glue it shut like in the picture above. Step #7. 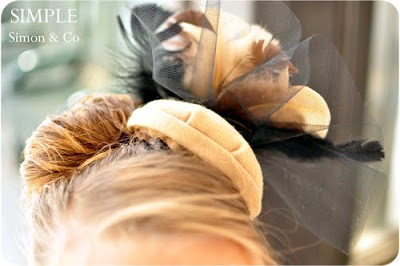 Glue that fabric snake around the bottom edge of your headpiece. Step#8. Now your ready for the fun part—embellishments!!! Keep the glue gun fired up and go crazy. On the birdcages in these pictures I only glued on feathers and vintage buttons (which I really liked) but on others I have glued on things like lace, doilies, and miniature birds. Just be creative and keep gluing until you like the outcome. Now your done and ready for an afternoon out on the town. So put on that birdcage and find your wool cape. It’s time to go stop some traffic…or get a Happy Meal…either way you’ll be perfectly over dressed and loving every minute. Remember how I said my heart skips a beat? Can you blame me? Man, I love this kid. 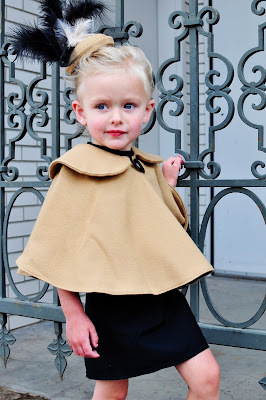 Post edit….please know that this tutorial and The Audrey cape tutorial are for personal use only. If you would like to sell from this pattern, please contact us for more information. these are so British! I love it! It’s like Breakfast at Tiffany’s meets the Royal Wedding – so whimsical and fantastic! Sooo cute! Congrats on your win this week, your look was amazing! Love, love, LOVE. AND, it’s deceivingly easy…even I could make it. So thanks! NO chop busting here…I am a quilter, I have never sewn a (successful) piece of clothing (that would include the “oh, you can do it” apron…LOL)and this, well, this could do! Thanks for sharing! OMG!These are adorable. Guess what my granddaughters are getting for Christmas?!? thanks! Okay, so so so cute!! And with that cape? Love. It. I LOVE LOVE LOVE this! I have two girls ages 3 and 5, who this will be just PERFECT for! Thanks for the tutorial! I’m gonna have to make some of these! OMG! Your girl here is trés chic!! I think I’m going to make this (or try to in bewteen running after the boys and chores) for my niece. Thank you for visiting my blog and leaving the comment. I really appriciate it. so cute, you guys are so very clever! This is so creative and wonderful! How DO you come up with this stuff? I used this tutorial as part of a fun and cheap DIY Kate Middleton Halloween costume. Thanks for the inspiration! These are so cute and sophsticated!! I wear mine, a sky blue feathery concoction, all day long: I love it. Although I have to admitmust confess, one afternoon, when picking up my daughter at daycare, a little friend of hers asked: Why are you wearing a feather duster? :D, I really laughed!.